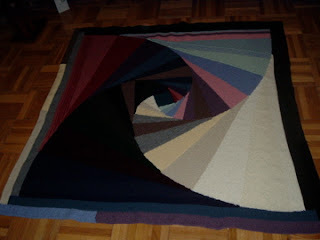 Curve of Many Colours – 1st border finished! Being a masochist, I decided to do two borders on this blanket – one log-cabin style, and one mitered. To be quite honest, I’m getting tired of this project but must finish it and the yarn I started with. Curve of Many Colours – done! I must admit, I was not sure I would like the curve of many colours, but I really do. It looks great. I like the idea of one, but the giant item seems like too much. Maybe at this time next year. (a balmy 8F -13C) It would be a good snuggle knit. Very nice. 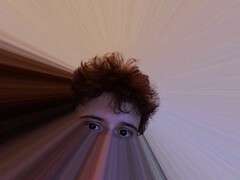 It’s like a modernistic painting! Thanks for your comments! It has been a great “snuggle knit”… for this reason I will continue (the weather being about as balmy here as it is wherever Mary Lou is. I would NOT want to be knitting it in the warmer weather. If I were to do the pattern again, I would probably go two or three colours – more stark. But this was a GREAT stashbuster! I love it! every time I look at your latest progress I think, “I have GOT to make that! !” Thanks for sharing your photos!! Very nice, I’ve seen this idea in a sweater but I think it’s much better as a blanket. You have very nice colour sense.